As you’d expect from its name, the dominant palette to C. Morey de Morand’s Inextinguishable Green (2007-08) is somewhere between grass and young wheat, a colour field in more senses than one. The choice of title, as of tint, is charged with purpose. Morey de Morand is a geometric abstractionist, following in a line that traces its ancestry back, in Western Europe at least, to Piet Mondrian. Mondrian, working in red, yellow and blue, famously pronounced an anathema on secondary colours. In particular, he professed a revulsion for green: a plastic tulip, kept in a vase in his Paris studio, was pointedly painted white. For Morey de Morand to work almost entirely in secondary colours – orange, violet, shades of grass – constitutes a quiet declaration of war. But on what, exactly? The broad answer to that is, on history. The neat bifurcation, in the late 1940s, of the traditions of abstract painting into geometry and expression led to the taking of extreme positions. Abstract expressionists, typified by the paint-slinging Jackson Pollock, had the corner on emotion. Contrariwise, geometric abstractionists, descending from Mondrian, were all about the intellect – about Platonic form, cerebral exactness. For Morey de Morand, herself a one-time expressionist painter, this split is clearly unsatisfactory. More, perhaps, it is repressive. To deny emotion is to deny nature; and nature, as the title of her painting suggests, just will not be extinguished. There is in other words, a case to be made for seeing Morey de Morand as a history painter. The Inextinguishable Green of her work deals in a specific way with a specific history; or, rather, with specific histories. For all that it sides with Mondrian’s tulip, Morey de Morand’s green is insistently anti-natural, intently acrylic. Its aim is not to evoke some kind of romantic past, a lost landscape tradition. Her green is there to make the point that history can not simply exclude a colour as imperfect. For all Mondrian’s attempts to paint over the world in primary colours, the verdant truth will out. I said that Morey de Morand is a painter not so much of history as of histories, and I think that this is true. As always with her work, Inextinguishable Green was made in response to a particular place. At the end of 2006, the artist took up a residency in Berlin. Of all the cities of the world, the German capital is perhaps the one with the most to hide, the place whose modern history demands be seen in secondary, rather than primary, colours. The effect on Morey de Morand of her move to Berlin is spelt out by a dramatic change in her style. Tomorrow’s Memory (2007), painted in London just before taking up the residency, is clearly worked out in increments of order. If its vocabulary is still one of colour, its grammar is of geometry: the picture’s unvarying verticals and horizontals echo the orthodox orthogonals of the modernist grid. Inextinguishable Green, made a matter of weeks later, throws all these rules to the wind. Faced with the troubled German history of order – of orderliness, ordnung, of obeying orders – Morey de Morand seems suddenly to re-think the whole question of art. Now, on a seditiously green-painted linen field, the signifiers of order become deeply disordered. The gestalt of Inextinguishable Green is all to do with the fracturing of its parts. The image’s visual elements are jagged, scattered, split up by sporadic fields of emptiness. Its geometric forms – the trellis, a rhombus of parallel lines – are recognisable, but do not behave as we would expect them to. The picture looks like the aerial view of some kind of institution or installation; its shard-like shapes and expressionist geometry put one in mind of Daniel Libeskind’s Jüdisches Museum, also in Berlin. Where the orderliness of Tomorrow’s Memory seemed to endorse modernist orthodoxy, the disorderly order of Inextinguishable Green reminds us that modernity is built on old foundations: that history, like the colour green, will always show through. I am particularly intrigued, in Inextinguishable Green, by the rhomboidal trellis form in the picture’s top left-hand quadrant. As I’ve said, Morey de Morand’s insistently acidic palette rejoices in its own artficiality. If it carries any colourist echoes, they are not of some lost, lyrical landscape tradition but of the happy brashness of Pop Art – in particular, in the trellissed area, of the work of Patrick Caulfield. Caulfield, who died in 2005, was an old friend of Morey de Morand’s; he lived and worked near her London studio. It is tempting to read the trellis-shard as a memorial to him both as a man and as an artist. Morey de Morand notes, by way of clue, that the electric blue rectangles in pictures such as Searching Identity (In and Out) (2007-09) are a direct quotation from one of Caulfield’s last paintings, Bishops (2004). In the same work, two rectangles of popsicle-coloured vertical stripes are an open allusion to another of the artist’s heroes, Bridget Riley. They reproduce, in feel if not in fact, Riley’s colour-stripe canvases of the late 1960s – the Tate’s Late Morning, say. In other hands than Morey de Morand’s, this open quoting from fellow painters might feel like a postmodern game, the sly, wink-and-nudge self-awareness of the early 1990s. In these canvases, though, the air is altogether more grave, more grown-up. As I’ve said, Inextinguishable Green was made as a direct response to a particular place. The idea of Berlin as a palimpsest, of the permanent now of its history, clearly underlies the work. But what gives Inextinguishable Green its power is the sense that it is something more than just hypothesis or theory – that the layering of its history applies as much to Morey de Morand, as a woman and as a painter, as it does to the city in which the picture was made. You see this coming-together of histories most clearly in the work, made since the artist’s return to London, from which the current show takes its title. Rewired (2010) has something of the feel of an implosion, of a re-ordering following some sort of emotional Big Bang. The picture’s brightly-coloured linear elements seem to dance over the canvas, apparently as an antidote to the heavy, static forms of black and brown behind them. But this first impression of difference is wrong. The flatness of Morey de Morand’s surface – a direct contrast to the heavy impasto she was using a decade ago – resolves the diverse pictorial elements of Rewired into a single, unified element. The colour tonalities, too, suggest one-ness. There is no under or over in the work, no darker and lighter, no before and after. 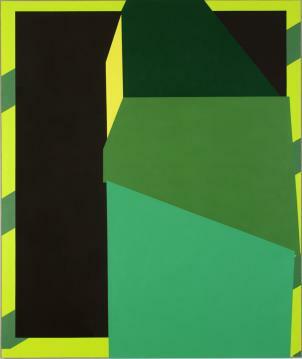 The rhomboidal shape at the composition’s centre echoes one in De Sidere (For Paulita) (2010), painted in response to the death of an old and loved friend. You might see, in the perspectival possibilities of this shape, a moment of openness or of closure, a beginning and an end. As with all Morey de Morand’s work, the point is not what is known but what is felt, what is left to be imagined. In memory of Paulita Sedgwick (1943 – 2009). Charles Darwent is art critic of the Independent on Sunday.